1) Giving the janitor in the cafeteria a confused/terrified look when he tries to flirtatiously joke with you will immediately stop him from flirtatiously joking with you. 2) A big bear hug is just as well accepted as a purchased gift, except the former is free. 3) Buy the wine you bought just because it was named “Fancy Pants” again, because it was delicious. 4) Vegetarian sushi is not and never will be the same as non-vegetarian sushi. Don’t even pretend. 5) Your gut is a powerful and prophetic thing. Go with it. 6) Never be crazy enough to jump out of anything — planes, helicopters, spacecrafts, etc. It’s not that you’re a scaredy cat — it’s just that God firmly planted your feet on this ground for a reason and you’re smart enough to stay put. 7) It’s OK to be a scaredy cat sometimes. 8) Be patient. Sometimes it means the difference between your favorite mug being clean and your favorite mug falling to the floor and shattering into a bazillion pieces. 9) Down time is good. It does not always mean you’re lazy. Unless you haven’t gotten out of your pajamas all day — in which case, yes, you probably are lazy, but it’s still OK sometimes. 10) Love those crazy people in your life every day because, let’s be honest, you’re probably a little bit crazy, too, and they love you anyway. If I had known some of these truths earlier in my life — like, say, middle school — I probably would have avoided many an awkward moment, or year. But life isn’t always fair that way. Sometimes you have to go through a LOT of lessons to get older. And I’ve still got a ways to go. 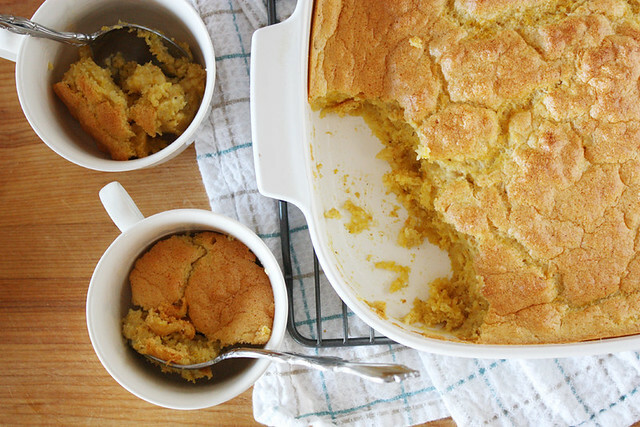 In the meantime, however, I’m going to go with the flow, drink my Fancy Pants wine and make copious amounts of this roasted pumpkin spoonbread because this, too, is worth remembering. The only other time I’ve eaten fresh pumpkin is when my mom has baked it up in her amazing pie. Usually I buy the stuff from the can and call it a day, but every time I do I slap myself upside the head because I know that the homemade stuff is stupidly simple to make and tastes a million times better (read: Things I haven’t quite learned yet). For this recipe (and really, any other time a recipe calls for pumpkin puree), it is imperative that you roast a real live pumpkin for it. Just do it. Not only will you realize just how ridiculously easy it is to do, but your life? Forever changed. 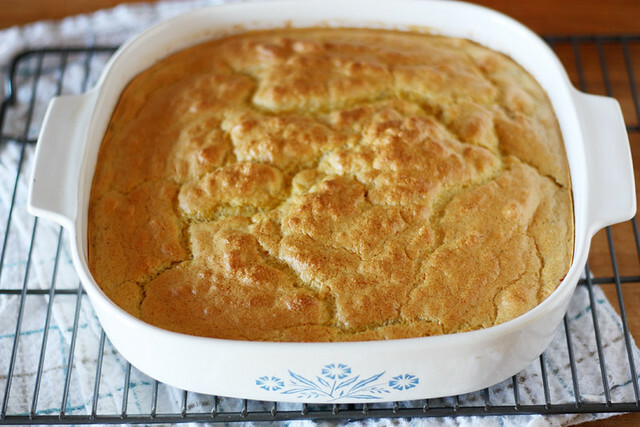 As for this spoonbread — the lovechild of a souffle and a cornbread — it is also imperative that you make it with patience and love and then devour it immediately with friends and family, lest you let any of this sublime goodness go to waste. If you do, never let it happen again and remember to make this recipe again for Thanksgiving, or for any future get-together. Lesson learned. Preheat oven to 400 degrees F. Cut the stem off top of pumpkin as you would if you were carving it; discard. Cut pumpkin in half vertically. Scoop out pulp and seeds with a spoon. 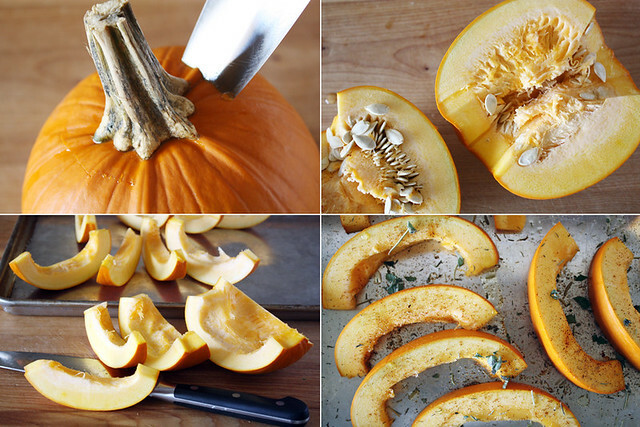 Slice pumpkin into 1-inch wide crescents; place each crescent on its side on a baking sheet. Drizzle slices with olive oil, then sprinkle with rosemary, sage, thyme, chili powder and/or cumin, to taste. Sprinkle with salt and pepper to taste. Bake slices until soft and edges are slightly browned, about 30-35 minutes. Remove from oven and cool completely. 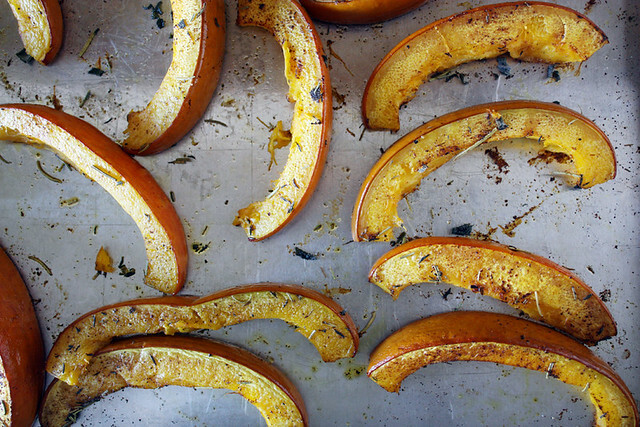 Once cooled, scoop out roasted pumpkin flesh from its shell and place in a large bowl. Mash pumpkin into a puree. Reserve 1 cup (save the rest for other tasty savory pumpkin recipes, or to eat with a spoon straight out of the fridge later when you need a midnight snack). Heat oven to 350 degrees F. Lightly grease a shallow 2 1/2-quart ceramic baking dish with cooking spray and set aside. 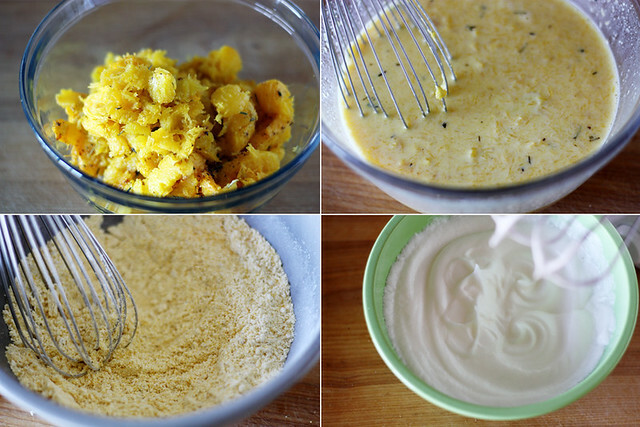 In a large bowl, whisk together reserved pumpkin, buttermilk and egg yolks. Set aside. In a large saucepan over high heat, bring butter and 1 1/2 cups water to a boil; once boiling, remove from heat. 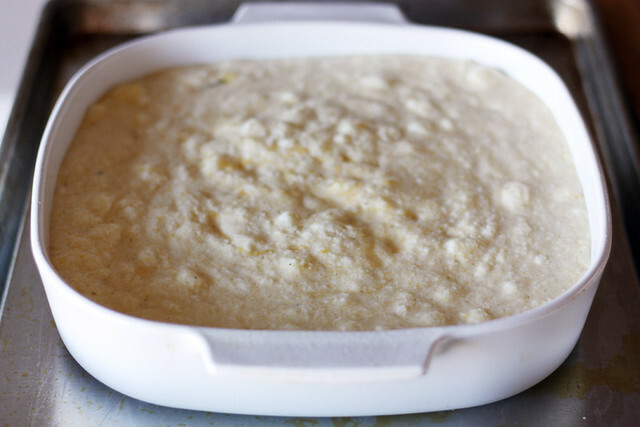 In a medium bowl, whisk together cornmeal, brown sugar, baking soda, salt and pepper. Gradually whisk cornmeal mixture into saucepan until well blended. Then, gradually add in pumpkin mixture and whisk until well blended. In a small bowl, beat egg whites with a hand mixer on high speed just until stiff peaks form, about 3-5 minutes. Gently fold egg whites, one third at a time, into mixture in saucepan. Carefully pour entire mixture into prepared baking dish. Place baking dish in a roasting pan or high-rimmed baking sheet and place in oven. Pour boiling water into roasting pan or baking sheet until water reaches about halfway up the outsides of the baking dish. Close oven door quickly and bake until spoonbread is golden brown and a toothpick inserted a few inches from the center comes out clean, about 50 minutes to 1 hour. Remove from oven and serve immediately. Thank you for validating that it is okay to be a scaredy cat! I needed that one. And thank you for this delicious looking recipe. I’ve been wanting to try spoonbread for the longest time! I will be making this this weekend and spooning it up while on the couch mentally chanting “down time is good. Down time is good.” Ugh. The only thing holding me back is roasting my own pumpkin. Do you think it would be not worth making with canned pumpkin? Erika — You can definitely use canned pumpkin 🙂 It just won’t have the same depth of flavor as it does with real pumpkin — but it still will be yummy. Sounds like you’ve got a perfect weekend planned! That looks really delicious indeed! I would love to try this when I get my kitchen back to working condition! This looks seriously, seriously good. YUM! He suggested I ask you my question:: I love to bake, even more I love to bake with pumpkin, HOWEVER I have been having difficulty lately figuring out how to make my pumpkin baking taste more spicy. What do you recommend? Sometimes I will follow the recipe to a T and others I double the pumpkin spice but I can never seem to end up with my pumpkin baking actually tasting like pumpkin. Do you have any recommendations?? also…do you taste your baking along the way as you bake? Or not until it is a done and finished product?? Lori — Thanks for the comment (and hi, Josh :))! That’s a really good question and I’m not sure I have the “perfect” answer for you. My best suggestion? 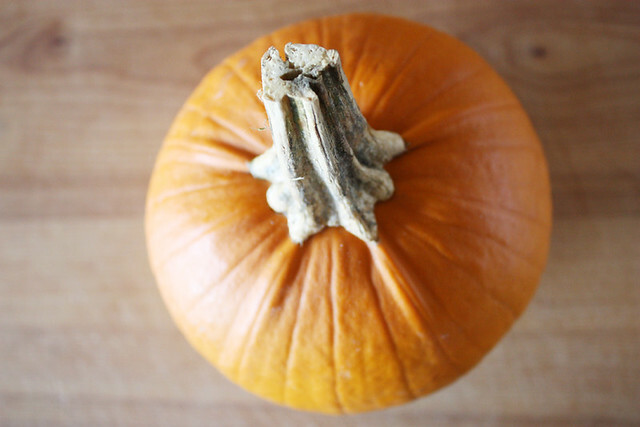 Use real pumpkin from a pie/sugar pumpkin instead of the canned stuff. My only other advice would be to up the measurements of cinnamon/nutmeg (but it sounds like you’ve already done that and it didn’t help). You could also increase the amount of salt or sugar in the recipe a teensy bit to bring out more of the flavor of the pumpkin, but I really would suggest that only as a last resort (you don’t want an overly sweet or salty end result!). Josh says hey, wish him luck for his Residency interview!! I love spoonbreads but the problem is that I dig my spoon into the bread and never stop eating it. This looks incredible! It’d be gone in a day! Luv — I strangely have the exact. same. problem. 🙂 Thanks for the comment!